The first ranking of the most chosen global FMCG brands launched today by Kantar Worldpanel reveals the brands that are being bought by the most consumers, the most often. The emerging markets (Asia, Latin America and Saudi Arabia) are driving growth (up to 98%) for those brands in the Brand Footprint ranking that are growing their reach, it reveals. It is Coca-Cola that leads Kantar Worldpanel’s Brand Footprint ranking as the world’s most chosen brand, being chosen 5.3 billion times a year. The beverages drink manufacturer reaches its number one spot by combining a high penetration of 44% with the highest global frequency of purchase (15 times per year on average) meaning that it is chosen a total of 5.3 billion times a year. Kantar Worldpanel’s Brand Footprint Ranking reveals the strength of brands in 32 countries around the world, across the food, beverage, health and beauty and homecare sectors. It uses an insightful new metric called Consumer Reach Points which measures – for the first time – how many households around the world are buying a brand (its penetration) and how often (the number of times shoppers acquire the brand). This unique calculation of penetration and frequency helps FMCG manufacturers to clearly understand their global reach in terms of actual basket reach and provides a vital guide on which regions present the biggest opportunities. The strongest brands in the ranking have demonstrated their ability to understand and respond to local needs and reach the most remote consumers in rural areas of emerging markets by building larger distribution networks. However all of the brands still have plenty of room to recruit more shoppers in new geographies, new targets, new segments or on new occasions. • Emerging markets drive growth - Seven of the top 10 brands in the ranking show significant increases in their growth driven by the emerging markets – Coca-Cola, Colgate, Dove, Maggi, Nescafe and Pepsi. Coca-Cola increased its growth in these territories by 7% gaining 230 million Consumer Reach Points. • Globalisation is on the rise – Although international brand owners are driven by social- demographic and cultural trends, consumers often don’t differentiate between local and global brands. To achieve significant household penetration locally a global brand must know its consumers intimately and not impose the brand’s home culture on the local market. Safeguard and Crest are only two Western brands in the top 20 league in China. • Local brand giants – 23 local brands around the world achieve more than 500 million Consumer Reach Points: Wahaha, Shuanghui, Want Want and Bright in China amongst them. 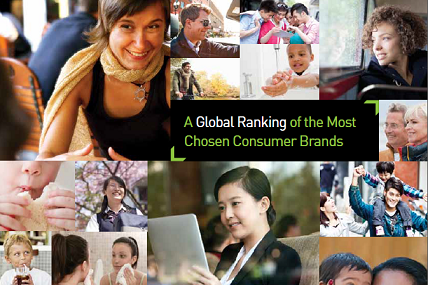 Kantar Worldpanel’s Brand Footprint ranks the most chosen FMCG brands across 32 countries from four continents (Asia, Latin America, Europe and North America) comprising 823 million households. It is based on analysis of measures of how many households purchased a brand at least once in 2012 (penetration) and the average number of times households bought the brand (frequency). The calculation uses a new metric, Consumer Reach Points, which measures a brand’s strength based on how many shoppers are buying brands and how often.